This cream colored tote bag was hand painted by me. The tote measures 13.25" inches high by 12.25 wide. 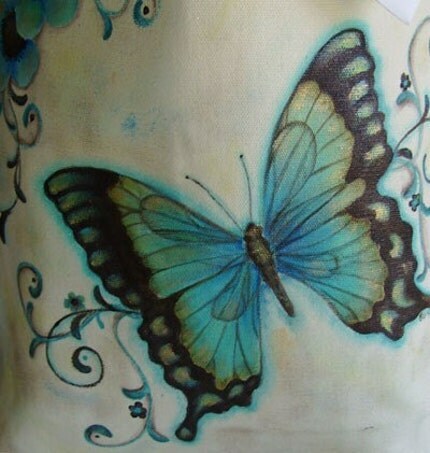 Butterfly: The butterfly is painted with a mixtures of blues and greens. The edge of the wings are painted in Dark Chocolate. The entire butterfly is dusted with gold mica powder. Flowers: The flowers are painted in a mixture of blues, white, and dusted with gold mica. The butterfly and flowers are shaded with aqua blue and dark chocolate. The entire bag is highlighted with aqua blue, pearl blue, and gold mica. Folksy :: Buy "Copper ACEO,butterfly design"